At Paw Pals, we dedicate our time and energy to taking care of your cats while you’re away, either on vacation or for just a day. For a cat, it can be scary knowing that your owner isn’t there. Being left alone can be just as bad as being put in an unfamiliar place for a time until your owner returns. At Paw Pals, we understand this. We make sure your cat gets the love and attention they need in order to thrive, ensuring that they are happy and healthy. 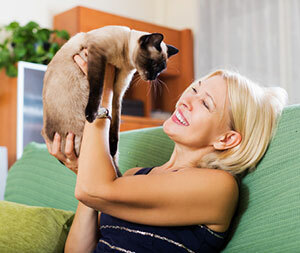 We know this because many of our Oakton, VA cat sitters are also cat owners, so we know that your cat will be treated with the respect they deserve. They’ll make sure to love your cat like they are one of their own until you come back home. Paw Pals is a licensed, bonded, and fully insured business, and our pet sitters are 100% PetTech certified in Pet CPR and First Aid. We give vacation visits and overnight cat & house sitting to those who need it. We also provide House Sitting and Garden Watering services, giving your house the tender loving care it needs just like your cat. Our Vacation Visits and Care Services are here to provide what your cat needs most, the love and attention of their owner, even if they aren’t there at the moment. Our Oakton, VA cat sitters can come over to take care of the cat while you’re away on vacation, so you don’t have to worry about them. They feed them, give them fresh water, play with them, give them treats, brush them, clean their litter box, give them medicine, and other Oakton, VA cat sitting services that you can ask for. A healthy cat is also a happy cat and no one knows it better than Paw Pals. Planning on leaving for the night and worried about your cat? Look no further than Paw Pal’s Overnight Cat and House Sitting Services. Our Paw Pal cat sitters will come over for 12 hours at around 7:00 PM – 10:00 PM to care for your cat. They can provide food, water, affection, brushing, medication, and litter box cleaning, along with other Oakton, VA cat sitting services. Just make sure to contact us two weeks in advance to schedule a Paw Pal visit.